The Anchorage Market, located in beautiful downtown Anchorage, is a favorite spot for locals to shop for everything from clothes to artwork; eat local food; and enjoy live entertainment. Visitors to Anchorage will appreciate the chance to buy Alaskan Made items, Alaskan gifts, and other souvenirs to bring home. 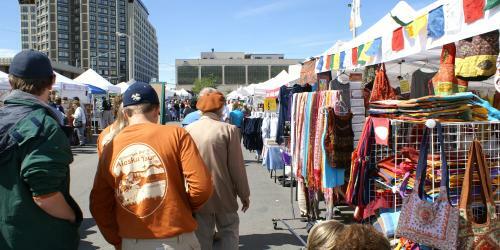 You'll also find everything from handmade jewelry or local honey to books depicting the Alaskan experience. Anchorage Market is also a great place for a quick and delicious meal. Food options range from world cuisines to local favorites such as halibut, salmon, and reindeer. You'll also find a variety of fresh and preserved fruits, honey, vegetables, and seafood. Free admission, live entertainment, great photo opportunities, and a family-friendly atmosphere make Anchorage Market a great place to spend a summer afternoon. Open Saturday 10AM - 6PM and Sunday 10AM to 5PM mid-May through mid-September.